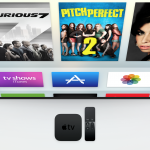 With the new Apple TV arriving in late October, the tvOS App Store is slowly, but surely, filling up with interesting apps that look great on the big screen. One of those is definitely Seasonality TV. 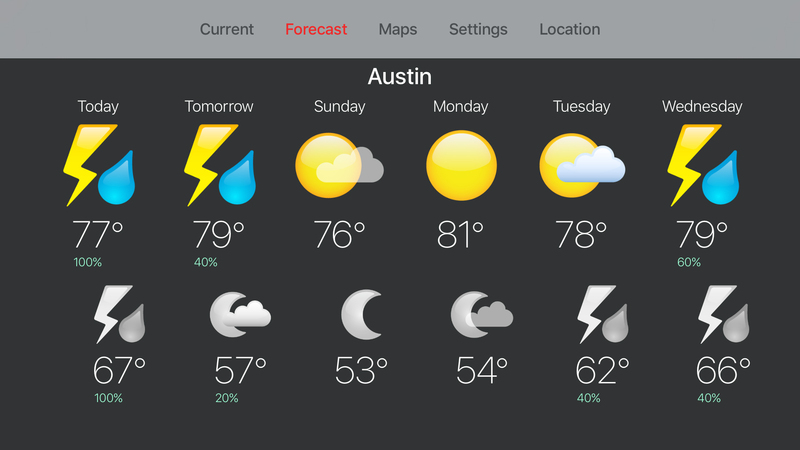 You can view three different weather maps on the app, including the beautiful particle mode. From developer Gaucho Software, Seasonality should be a familiar name to anyone who enjoys tracking the weather around them as the company has previously released a number of iOS and Mac apps. And Seasonality TV takes that experience to your living room. The main screen shows a nice amount of weather data including current conditions, a cloud profile, astronomical information, a six-day forecast, and more. Here’s a quick video that shows the app in action. Click here if you can’t see it. The best feature of the app is the Maps section. Along with radar and surface temperature information, the Particle Mode map is my favorite. To help you visualize the wind conditions around the world, the map shows thousands of animated particles. It look wonderful on my TV screen as its fun to scroll around and see the wind on every inch of the planet. 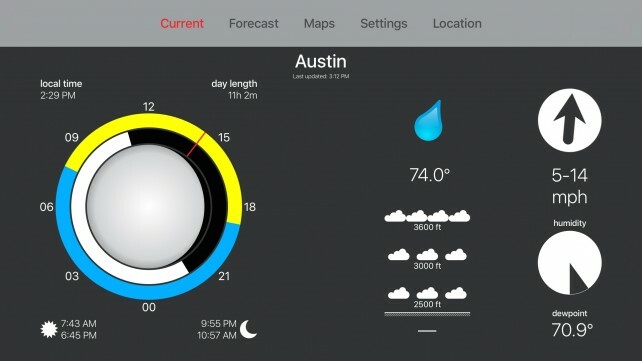 You can view the weather outside your door or anywhere in the world. Seasonality TV can be downloaded now on the tvOS App Store for $9.99. While I enjoyed getting to use the app, I don’t know if there are enough features to justify the price past the beautiful Particle Mode map. If you’re looking for a less expensive weather app choice, I can also definitely recommend the snarky, and hysterical, Carrot Weather for the Apple TV that costs $3.99. If you’re interested in taking a look at the app on your iOS device. There are two different titles to try out. Seasonality Go is $5.99 and compatible with the iPhone/iPod touch and iPad/iPad mini. It features a great modular interface on the iPad that allows users to create a number of dashboards to track the specific information they are interested in. 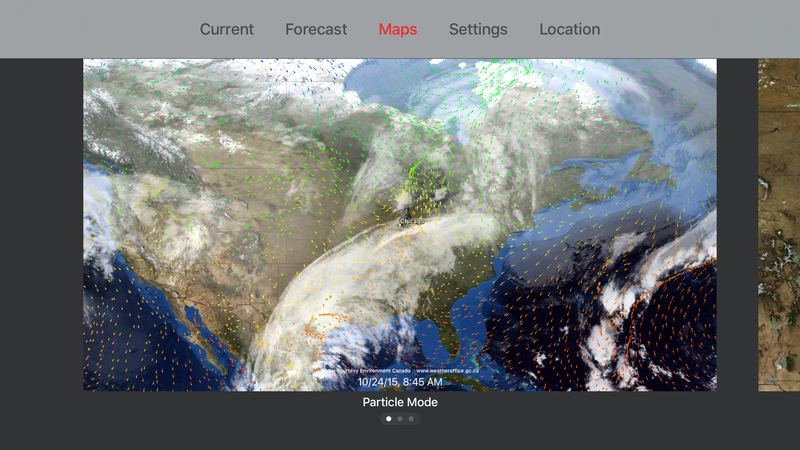 Designed for advanced weather trackers and meteorologists, Seasonality Pro gives you weather forecast model data at full resolution. All of the data is layered on top of configurable base maps. It’s also $5.99 and compatible with the iPhone/iPod touch and iPad/iPad mini. 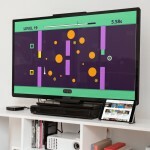 For other recent Apple TV app news, see: The Apple TV’s Siri Remote takes center stage in Echo from ArcTouch, Puzzle adventure game Lumino City is even better with Apple TV, and Disney Infinity 3.0 brings the Battle of Yavin to your Apple TV.